Cross Country by James Patterson, a Mysterious Review. 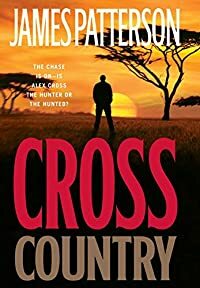 Review: Alex Cross is drawn into the ruthless underworld of Washington D.C. on the hunt for a man known only as "The Tiger" in Cross Country, the 14th thriller featuring the forensic detective in this series by James Patterson. When Ellie Cox, a college friend of Cross, is killed and mutilated along with her family, the crime attributed to a gang of fearless, riotous teenage boys, Cross knows that he will hunt down their leader, a mysterious figure called the Tiger, no matter how long it takes or where it takes him. Anyone who was known writing about, or checking into the background of, an organization or individuals dealing in drugs, oil, money laundering, and more in the nation's capital become a target for this diabolical warlord. The cold-blooded, brutal murderers he had encountered in the past do not compare with the callous ruthlessness he would soon be a part of. Cross' quest ultimately takes him to Africa where he meets a reporter who had known Ellie and was also seeking information about the Tiger and his murderous escapades for the press. The person or persons giving the orders on what family should be killed next remains, however, a mystery. Alex turns to the CIA for help but their help is in short supply. Soon Cross the hunter becomes Cross the hunted in the decrepit, dilapidated, and decaying cities of Africa. He is arrested, jailed and tortured for three days, before the CIA is able to get him released. Cross sees the most horrible situations for men, women and children that could possibly exist. And he is forced not only to watch it as it happens, but to become a part of it. Cross Country is one of the most perplexing entries in this long-running series. In many ways it is atypical and fans of the Cross mysteries may be disappointed that the plot is more action-oriented adventure than psychological thriller. As in previous books, Cross is expected to deal with the worst kind of criminal, but here, the images evoked are far more horrific than anything previously written. It's really overwhelming. One might wish that Cross finally marry his sweetheart and take Nana and the kids on a long vacation together somewhere sunny and warm, far away from what he experiences here, and leave the horror of murder to someone else. But what makes Cross such a powerful character in crime fiction is that he perseveres, always certain that his work makes a difference, if only to just one person. Special thanks to guest reviewer Betty of The Betz Review for contributing her review of Cross Country. Acknowledgment: Margo Nauert provided a copy of Cross Country for this review.